The City of Colonial Heights provides residents with curbside recycling service every other week through the Central Virginia Waste Management Authority. 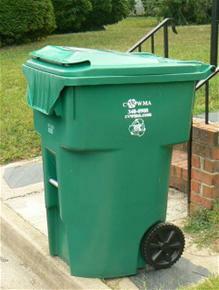 Curbside pickup of recyclable items is scheduled for every other Friday. Visit www.cvwma.com to view your curbside recycling collection schedule or to sign up for a collection day reminder by email. The City provides each resident with a 96-gallon recycling container (see image at right). To obtain a second container, please visit www.cvwma.com or call the Recycling Hotline above. (Additional recycling containers are $65). Residents may also continue to use their old recycling bin in addition to the new 96-gallon container. Recyclable items that are collected include cardboard, mixed paper, steel and aluminum cans, plastics with #1- #7 bottles and containers, caps and lids (all free of food and residue), waxy cartons such as milk, juice, juice boxes, and egg substitutes, glass bottles and jars. No plastics bags, Styrofoam, or food contaminated pizza boxes are accepted. Recycling Perks is a program offered by the City's recycling service provider that allows residents to earn points for recycling. The points can be redeemed in discounts and coupons at local retailers and restaurants. To register for this program, visit www.recyclingperks.com.